As a pup, Coal was rescued from the property of a large drug raid in Louisville, Ky. Thanks to the wonderful advocate and Samaritan Ellen McKnight, he was lucky enough to come to Pit Mountain Rescue. At 6 months of age, he moved in with a foster family. They quickly fell in love with his silly antics and sweet personality. After just a few weeks, they realized that they couldn’t imagine their lives (or the lives of their other three dogs who Coal played with) without him. In 2009 Coal obtained his Canine Good Citizen certification and in 2010 was certified as a therapy dog with Love on a Leash: Healing Paws chapter in Indianapolis, Ind. Coal enjoys the visits where he gets to meet and greet new people. He has a habit of looking into a person’s eyes with his soft and soulful brown eyes before giving them a gentle nudge with his soft muzzle to remind them that he loves to have his chest scratched. Coal has a gentle way of working his way into the good graces of people who are either misinformed about pit bulls or don’t consider themselves a “dog person” at all. 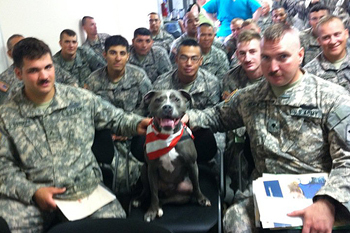 His favorite type of therapy visits are when he gets to welcome home newly returned soldiers from war. Coal and his handler participate in a program called Welcome Home Dogs, where they spend hours with newly returned National Guard soldiers who are completing their deployment demobilization at a National Guard facility. The soldiers are required to complete the four-day demobilization process at a base outside of their home state, and while they are technically on U.S. soil, they are not “home” and do not have the opportunity to see their family. Coal and the other Welcome Home Dogs are invited to hang out in the waiting areas where the soldiers congregate in large numbers waiting for their turn to complete their processing. The soldiers are always excited to see the dogs, and the demobilization staff have reported that the dogs always “take the edge off” and put the soldiers in a more relaxed and comfortable mind set. After the stress of a war-time deployment and the anxiety of their upcoming (official) homecoming ceremonies, many soldiers are unsure how to feel or act during their demobilization process. Coal comes right in to the crowded waiting areas, soliciting pets and hugs from everyone he can reach, and then proceeds to perform his silly tricks to an often amused crowd. 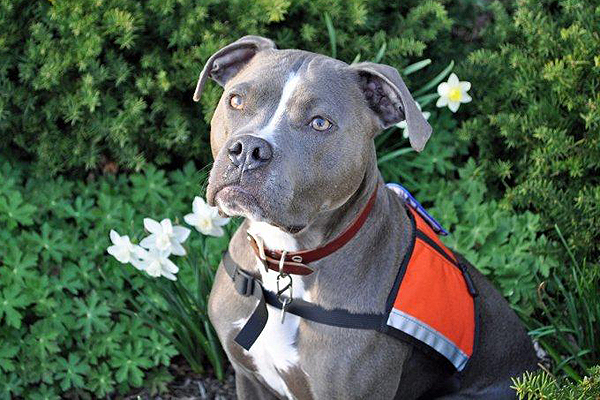 Coal’s handler takes the time to discuss Coal’s history and his personality as well as his job as an “ambassadog.” Often, the conversation includes the myths surrounding pit bulls, the benefits of adopting a rescued pit bull and responsible ownership of dogs and cats. In addition to a therapy dog, Coal also worked as a “friendly introduction” dog for the Humane Society of Indianapolis and is also a search and rescue dog with Indiana K9 Search and Recovery, as well as an “ambassadog” for Indy Pit Crew and the official spokesdog of Indiana Humane Lobby Day (where Coal’s handler and other advocates meet with Indiana Senate and House of Representatives to discuss the laws in Indiana that impact animals). That boy sure is busy! @maliceb4thought His work is never done, and he seems to love it all! I love his name and he a beautiful dog! He’s absolutely regal. What a wonderful thing he is doing. Love it…American dogs helping American soldiers. @rn4pitbulls Coal is an amazing boy! He is just beautiful. I LOVE that Coal is helping our service men, and at the same time he is helping to dispell the horror the media creates around the Pit Bull breed. Coal you are a lucky boy, with great parents! First of all Coal is gorgeous. Who wouldn’t want to get hugs and kisses from this boy. And secondly, what a FABULOUS program. Whoever thought that one up deserves lots of praise and my personal appreciation. The more more opportunities for pit bulls to strut their stuff, especially to a receptive audience the more they will show themselves to be emininently qualified to land in a good home I love these win/win programs – such a gift for everyone involved…Sounds like Coal is one busy boy, an “ambassadog extraodinaire”. 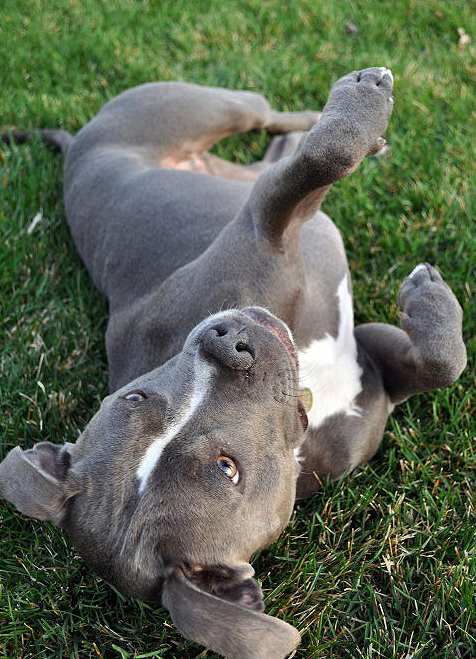 @VKelly So true, a great program that has two advantages, one of them showing how wonderful pit bulls are. Coal and Nina rule! I’ve had the pleasure of meeting both several times and they are truly stellar ambassadors for the breed! Keep representing! @VKelly Thanks for sharing this video with us. That is definitely Coal in that video providing much needed kisses to the soldiers!